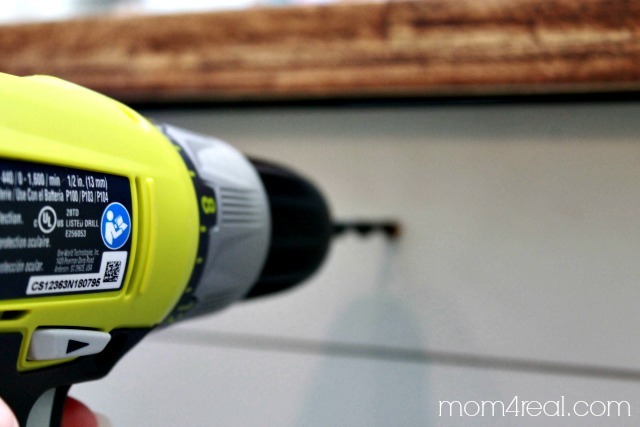 I am totally obsessed with finding inexpensive ways to make big changes in my kitchen! I am constantly thinking of ways to improve the function and space in there because it is tiny! Well, my friends, I finally figured out a way to add an island, and it cost less than $20! 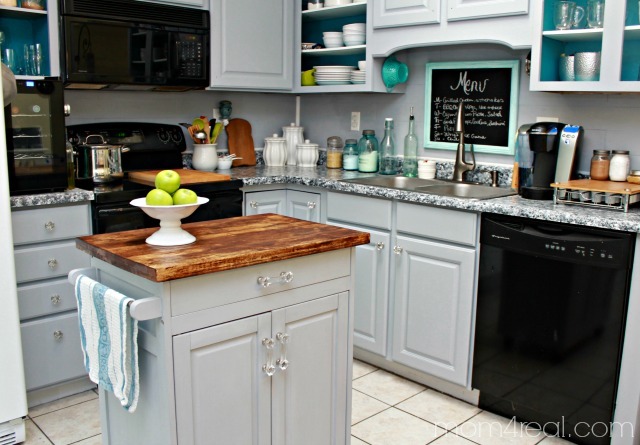 It’s the perfect solution for a small space and feels like it was custom made for my kitchen! 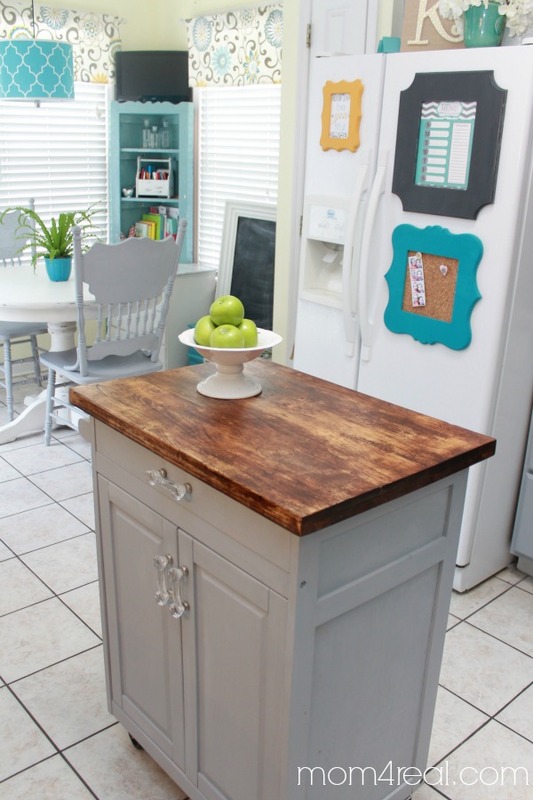 Let me show you how to turn a microwave cart into a kitchen island! 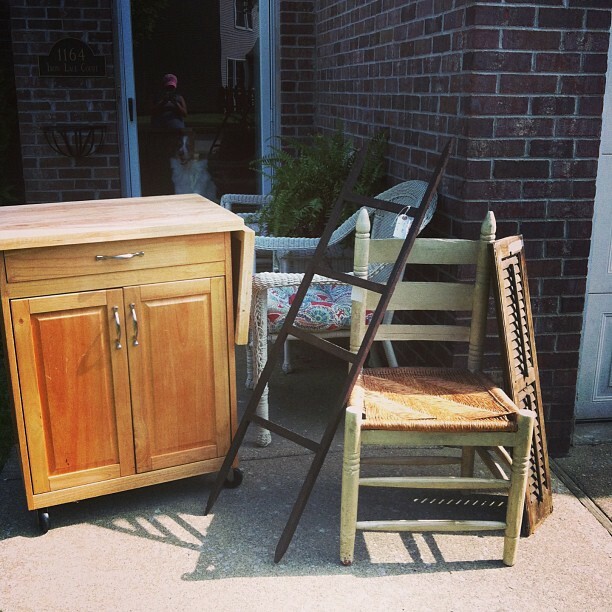 This is what I started with…my haul from our local Peddler’s Mall. As you can see, the microwave cart wasn’t in the greatest shape. It had many scratches, a really scratched up piece of butcher block on top, and the color….well, let’s just say, it’s not my favorite! Since this little cart is pre-owned, I am really not keen on using the butcher block as a cutting board. I just don’t know how it has been used in the past, so I sanded it down and stained it instead of leaving it as is. 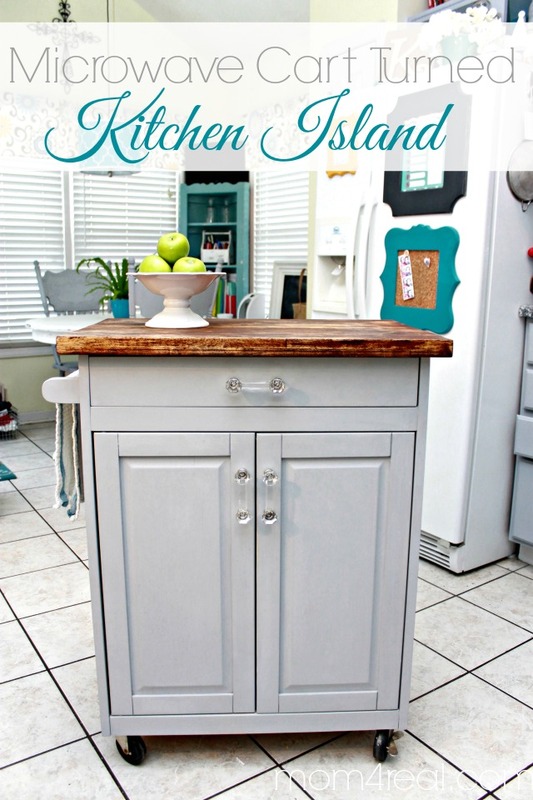 I also want the cart/island to match my cabinets, so two thin coats of my favorite chalky finish paint were in order. I finished it off with a coat of wax for protection as well. Next, it’s time to replace the hardware. The holes were a bit small for the new knobs, so I used my drill to make them a bit bigger. 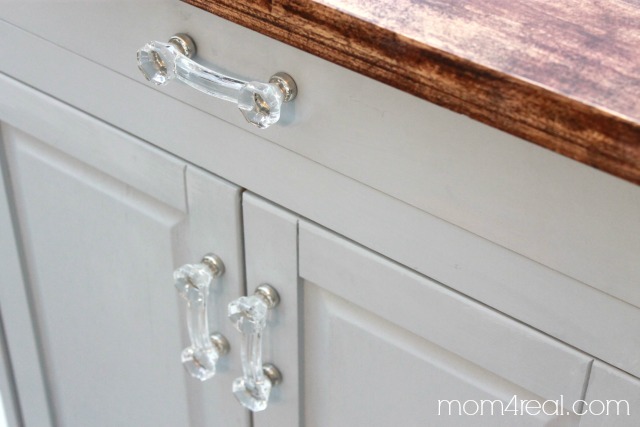 Aren’t the new glass knobs soooo much better? I am so pleased with the way it turned out! My little kitchen is on it’s way…one step at a time! Finally, my kitchen and breakfast nook are starting to look a little more like one big room instead of two spaces, and I have some extra storage as well. Win, win, right? I can’t wait to show you the rest of the changes in our kitchen. As usual, they are all budget friendly and you won’t believe what I used to change the counter tops…no more spongy looking faux granite! Yay! Where did you get you light over your table? I love it. Hi, Kim! Thank you! I actually made it and will be blogging about it soon! I love your kitchen. What colour did you use for the island? I have the same cart that I purchased at Target about 6 years ago. I am wanting to paint it. Glad it worked so well for you. Fingers crossed mine is as easy. Great post! Your cart turned out great. It looks like you stained the butcher’s block. What color/type of stain did you use? Did you use the wax finish or anything over the stain on the top? 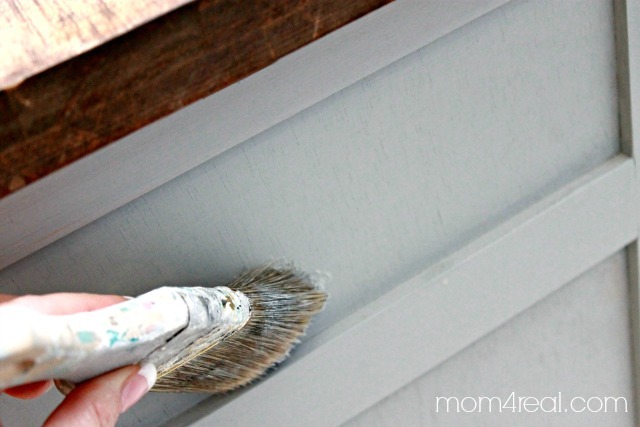 Or was the wax just the finish for the chalk paint? I used on the painted area of the cart just to seal in the chalk paint. For the top, I typically use mineral oil to keep it from drying out. Absolutely beautiful! I am asking what everyone else is asking! What color did you use for the cabinet!? Love it! To be honest, it was so long ago that I don’t remember the color name. 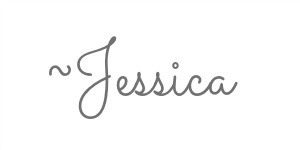 It is a light grey with more of a blue undertone, and it was a part of the DecoArt chalky paint line. I have seen it recently at Michaels. Hope this helps!